Today I have some nail art which I've tried for the first time. Basically, it's a technique where you remove as much polish as possible from the brush and dab it over a base colour - easy peasy. Today, I've done this using 4 polishes: Sally Hansen Red Snapper, Sally Hansen Good to Grape, Sally Hansen Shell We Dance, and Essence Off to Miami. I followed Chalkboard Nails' excellent tutorial, so have a look over there if you want a better idea of how this is done. I started by applying 3 coats Shell We Dance, a stunning sheer pink. Something I noticed about the Sally Hansen polishes is that the brushes are very wide - the width of the plastic stem is basically the diameter of the opening to the polish bottle. The wide, flattened brush makes application so easy though - perfect for getting close to the cuticle without making a mess. After SWD dried, I applied Off to Miami (coral), Good to Grape (purple) and Red Snapper (um, red) in that order, following the instructions from the tutorial. After finishing, I sealed my mani with a coat of Sally Hansen's Big Shiny top coat. I haven't used any mainstream top coats for a while, so I was frankly really impressed with this one. I tend not to have high expectations for top coats from mainstream brands, so it's nice to be proved wrong for once. It's definitely comparable in terms of dry time and glossiness to my favourite Rica Glossy Glam top coat. The only drawback is the shiny, metallic bottle - it looks super cool but it will be hard to gauge how much top coat is left in the bottle after continued use. Also, because I can't leave things alone... I mattified this mani too. I used the other sibling in the top coat pair - Big Matte. I haven't done a direct comparison yet, I'm pretty sure this is comparable to the Essie Matte About You top coat in terms of being a true matte. 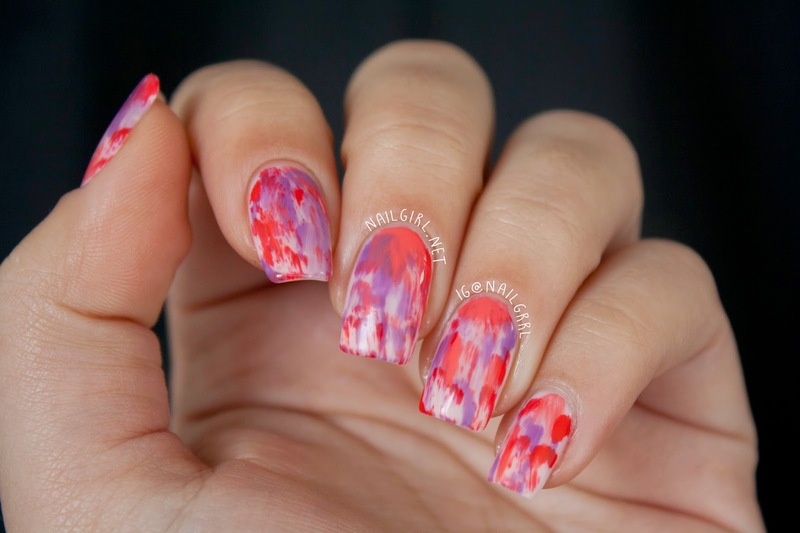 Love the different dimension it added to my mani - it totally reminds me of tie-dye. A tip for matte manicures - apply your regular top coat first and wait for that to dry before applying your matte top coat. 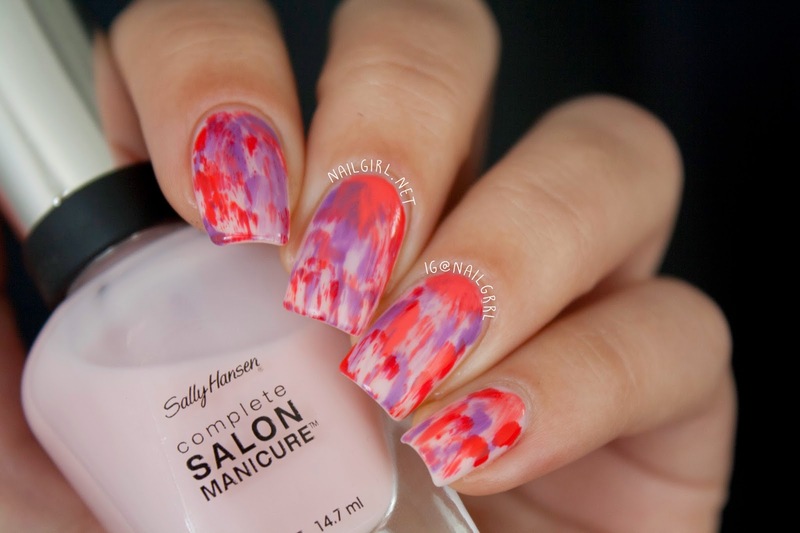 I find that manis last longer doing this, rather than going straight for the mattifying one. 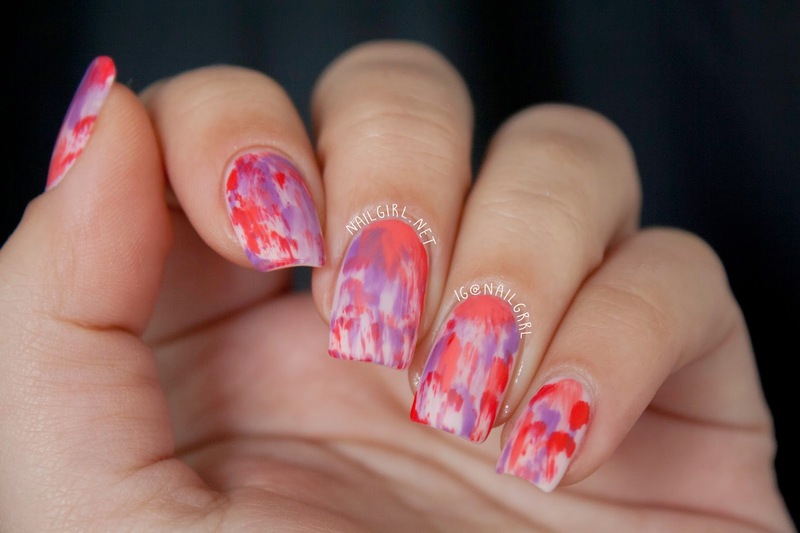 Think of it as a special effects top coat, rather than a sealing + drying one. I hope you like this as much as I do - I'm so so proud of my first dry brush mani, and I'll definitely be using this technique with other colour schemes. I'm also very impressed with the two Sally Hansen top coats I used - they definitely have a place in my top coat rotation (currently has Glisten & Glow HK Girl, Rica Glossy Glam). Big Matte and Big Shiny top coats are available from Farmers and selected Kmart, Pharmacies, and The Warehouse stores for RRP$14.99. The Sally Hansen Triple Shine range are also available from Farmers and selected Kmart, Pharmacies, and The Warehouse stores for RRP$12.99. Products in this post were provided to me for review. All opinions are my own. I ADORE it! amazing colour combination!